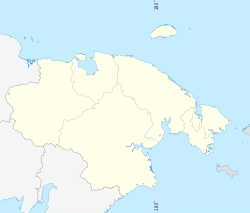 Anadyr (Roushie: Ана́дырь; Chukchi: Кагыргын, Kagyrgyn) is a port toun an the admeenistrative center o Chukotka Autonomous Okrug, Roushie, locatit at the mooth o the Anadyr River, on the tip o the soothren promontory that protrudes intae Anadyrsky Liman. Anadyr is the eastmaist toun in Roushie (mair easterly locations, sic as Provideniya an Uelen, dae no hae toun status). Population: 13,045 (2010 Census).